Star Creation is back for the second year as a platform for young aspiring fashion designer Asia with age range of 16-35 years old to showcase their talent. It's organized by Textile and Fashion Federation Singapore with Asia Fashion Excange and it's a great opportunity for budding designers to take on the challenge and a gateway for their dreams. The winner will receive cash prize, Audi young designer award, and a year internship at F.J.Benjamin, a leading fashion company in Singapore. By the judging process, 24 semi finalists will be chosen then being selected again to 12 finalists, the criterion is based on several aspects, like workmanship, choice of fabrics, viability of commerce/wearability and most importantly a creative concept. I had the chance to see the collection of last year's Star Creation and i believe this year it won't be less amazing! This year, the Theme is "Internationally Asian" with six design submission including sketches, technical drawing, and finished garment. Registration form is available for download here. 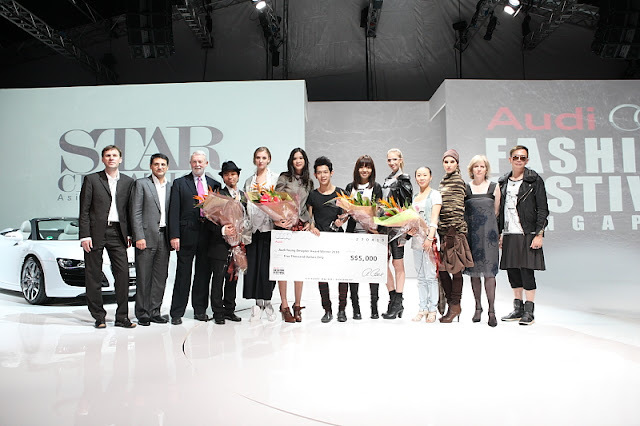 Runway showdown will be held at 11 May 2011 and on the prestigious Audi Fashion Festival 17 May 2011, while the registration deadline is on January 31 2011. So if you think you fit all all the criterion above and it pumps up your spirit, what are you waiting for? do register now! Brought to you by F.J.Benjamin, Audi, Spring, International Enterprise Singapore, and Singapore Tourism Board.